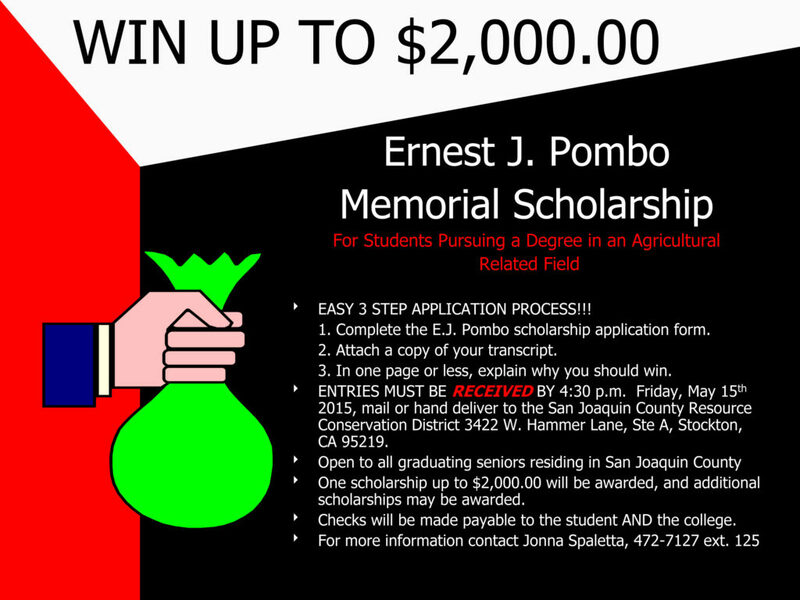 San Joaquin County Resource Conservation District (SJRCD) is pleased to announce the 21st Annual Ernest J. Pombo Memorial Scholarship contest. This year, one $2,000 scholarship will be awarded. Additional awards may be given pending available funds. To be eligible for this scholarship, the applicant must be a graduating senior and reside in San Joaquin County. Application form (all other applications will not be accepted). A current copy of the applicants’ school transcripts. A one-page essay explaining why the applicant should win. (Please include any agricultural interest or experience and relevant coursework, if applicable.) Please do not include any other documentation. SJRCD directors judge the applications. Notification letters will be mailed to all applicants. With the exception of a “professional looking” application, there are no secrets to the judging. Applicants should pay close attention to the three required items. Additional materials will not be considered. If you have questions, contact Jonna Spaletta at (209) 472-7127 ext. 125. Click on the poster below to download a PDF and advertise the scholarship to students.